Eddie W. Lee, Jr., originally from Loris, South Carolina, now resides in Agawam, Massachusetts. He has a Master’s Degree from The University of Massachusetts at Amherst in Communication Disorders and a Bachelor’s Degree from South Carolina State University, Orangeburg, South Carolina in Speech Pathology and Audiology. Eddie was initiated February 25, 1990 at Beta Delta Chapter, South Carolina State University in Orangeburg, South Carolina. He is the current president of Theta Iota Lambda Chapter seated in Springfield, Massachusetts and has served as chapter chaplain for many years. 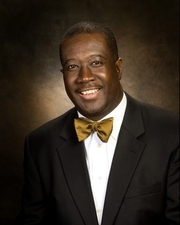 He also serves as the chairman of the chapter’s Founder’s Day Celebration since 2002. Eddie is a member of St. John’s Congregational Church in Springfield, Massachusetts where he works with the 20/20 Vision Team and Anna E. Hatchett Cotillion. Eddie has worked as a Speech Language Pathologist for the last 16years. He is currently employed at HealthSouth Rehabilitation Hospital of Western Massachusetts in Ludlow, Massachusetts. He works with the geriatric population experiencing communication and swallowing deficits as a result of a cardiovascular accident (stroke), traumatic brain injury, or degenerative diseases. Eddie is married to the lovely Carla Lindell James Lee. They are the parents of Abigail Madison Lee and Courtney Jordan James-Blocker.